This one-of-a-kind acrylic painting is done on a turkey tail feather. The feather is 13" tall and has been sealed with clear poly for protection. 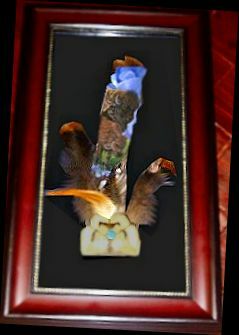 The main feather is accented with smaller turkey fluff and pheasant feathers and framed under glass on a black background. The frame is wood and is decorated with a gold bead around the glass. The frame measures 11 1/2" x 19 1/2 inches. The base of the feather is secured by a piece of turtle shell and has a genuine turquoise stone on top of the turtle shell as the final touch. This painting is signed and dated by Ohio artist Kathy Allen and is ready to hang. This item can be shipped internationally, but additional shipping charges may apply. If this is the case, we will contact you after your order is placed and we know where it is going. Feathers can't be imported to some countries (New Zealand for one), so check with your local customs department before ordering if you are outside of the US. We are not responsible for items seized by customs agents. The turtle totem is a symbol of mother earth and our ability to find happiness on mother earth. Turtle teaches to try and enjoy the journey as much as the final achievement. The turtle shell also symbolizes protection. The turquoise stone is one of the oldest protection amulets. If given a turquoise by a loving friend, that stone would protect the wearer from negative energy and bring good fortune. The turquoise is the symbol of friendship. It also brings peace to the home. This product was added to our catalog on 06/17/2007.